How awesome is the internet? A little while ago, I was watching David Fincher's far-fetched but entertaining thriller, The Game. If you haven't seen the film, there are spoilers ahead. At the end of the movie, some pretty unlikely things happen, but it's a lot of fun, and I think most audiences let it slide. 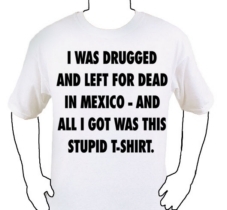 One of the funny moments at the end is when a character gives Michael Douglas' character a t-shirt which describes his experiences. After watching the movie, I thought it would make a pretty funny t-shirt... but I couldn't remember exactly what the shirt said. Naturally, I turned to the internet. Not only was I able to figure out what it said (from multiple sites), I also found a site that actually sells the shirt. They've even got a screenshot from the movie. Alas, it's a bit pricey for such a simplistic shirt. Still, the idea that such a shirt would be anything more than some custom thing a film nerd whipped up is pretty funny. I mean, how many people would even get the reference?